While there are some cases where a For loop might be reasonable, it's a general mantra – one I subscribe to myself – that "if you are using a For loop in Mathematica, you are probably doing it wrong". But For and Do loops are familiar to people who already know other programming languages. It is common for new Mathematica users to rely on loop constructs, only to become frustrated with performance or code complexity. My question is: are there some general rules of thumb that would help new users select the appropriate alternative to a procedural For or Do loop, and are there other useful Mathematica constructs, aside from RandomVariate/Nest/Fold/Inner/Outer/Tuples that they should know about in order to avoid those loops? If the list is multidimensional, nest another loop inside that. What are some useful guides to help users coming from other languages to Mathematica to improve the conciseness and efficiency of their code by avoiding unnecessary loops? Let's improve the specific cases given. Explicit loops are often counterproductive in Mathematica, not only taking more keystrokes, but also more execution time. They are also, in my opinion, more prone to mistakes. Better ways are to use Do, Scan, or Map. Do and Scan are (typically) appropriate for operations that do not accumulate a list of results, while Map and Table (a variant of Do) are (typically) used for ones that do. The third method uses Map (short form: /@) and accumulates a useless list of results; for this reason it is likely to be less memory efficient than the first two. which is preferred. However, there are more complex cases where Table is far more elegant than the alternatives. This could be improved in the manner of case #2, but there is a far better method available: Fold. Any time you want to iterate through a list, using the result of the previous "loop" along the way, look to Fold, efficient in both syntax and computation. There is nothing intrinsically wrong with this. However, all of the operations within the pure function have the Attribute Listable. Therefore, this function can directly accept a list without using Map, and this will be considerably more efficient. 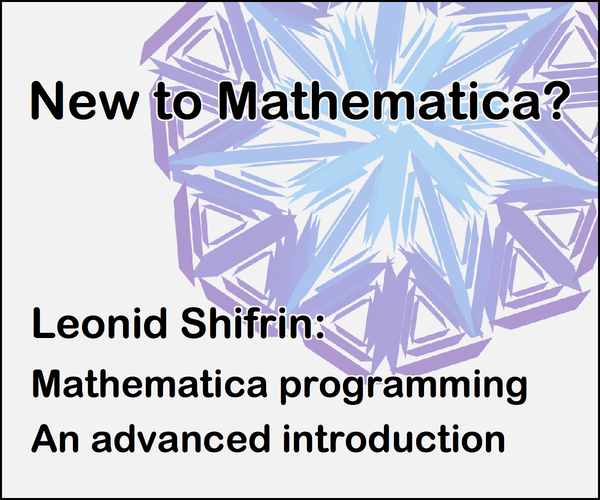 There are many alternative ways to approach various programming problems that do not use loops and are more efficient (and concise) in Mathematica. Most of them execute faster, but even where they do not, they are faster to type: development time matters, too! Here are some rules of thumb for easier programming and iterating on lists. For example, typical procedural programming will create an empty vector, and replace each element in turn to create the desired data. Of course, you have to start at i=2 to avoid adding the zeroth part, which is the Head, List, to the vector. 4. You can combine lists in very general ways using Inner and Outer. How about operations like arithmetic on lists, matrixes, & tensors or Dot and DotProduct? Just a sampling of things, some of which would require some extensive procedural solutions. "For" my part (pun intended), I stopped thinking in loops and started thinking functionally. More so, I began to think more like a mathematician than a programer. The better I do this the more efficiently I program in Mathematica. It would help if one could tie someone's "loop" or "procedural" arm to their body, like they do with boxers who need to switch their dominant hand. Ultimately, I think one has to give themselves over to the functional language. Maybe one can translate one language to another but poetry in English doesn't have the same meaning translated into Italian nor Italian to English. When one can dream in the language they'll have it. 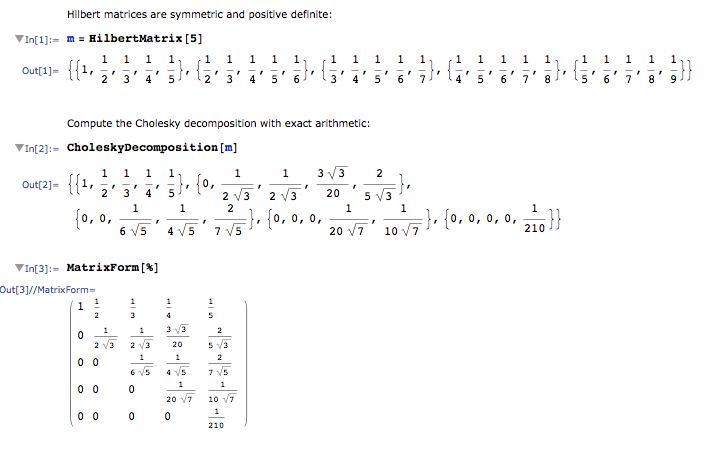 Consider one example of functional decompositions, the CholeskyDecomposition. Maybe this doesn't count in this specific discussion because it demonstrates a specific type of solution available for use in Mathematica, which essentially hides how it gets the solution from the user. On the other side, I'd argue that the functional paradigm in Mathematica has made these kinds of solutions and functionality more readily available. The Wikipedia entry cited above shows how procedural approaches attack the problem. One could replace every procedural construct in that code with a functional one and produce your own functional Cholesky Decomposition pretty readily. But Mathematica has already done that for us. probably do the same thing. Not the answer you're looking for? Browse other questions tagged performance-tuning programming coding-style or ask your own question. How should I go about writing more functional and list based code? What are some general strategies to avoid using For loops? What are the most common pitfalls awaiting new users? Are there any cases when For loops are reasonable? Is there a Break equivalent for short-circuiting in Table? Having used Mathematica as a “gateway” language, where to from here? How to avoid procedural loops in this example?